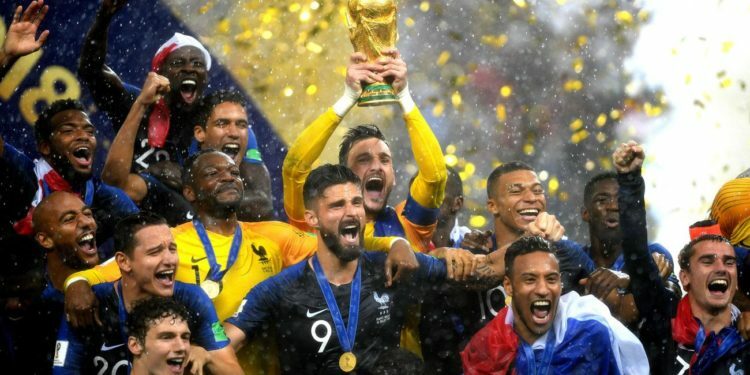 Six stations have been temporarily renamed by Paris metro in honour of France World Cup Heroes as the capital prepares to welcome them back. The French coach’s name features at two stops as Notre-Dame des Champs becomes Notre Didier Deschamps while one of the central stops is renamed Deschamps Elysées-Clémenceau. France beats Croatia 4-2 on Sunday. The winners will take an open-top bus along the central avenue in the heart of Paris later on Monday. Victor Hugo station is temporarily changed to Victor Hugo Lloris, after the France goalkeeper, while Bercy is renamed as Bercy Les Bleus, and Charles de Gaulle-Etoile changing to On a 2 Etoiles (We’ve got 2 stars). The two stars refers to the badge on the team shirt marking two World Cup victories. A long queue of supporters was formed outside a sports shop in central Paris on Monday as they tried to buy the updated national jersey. Local authorities in France have made public transport free to enable as many people as possible to join the party. Fans across France partied overnight, but celebrations in some cities were marred by violence. Tear gas were fired by Police as sporadic clashes broke out in Paris, Lyon, Strasbourg and Rouen with 292 people detained, according to French reports. The Paris metro transport system isn’t the only one with temporary change of name to honour World Cup heroes. Brussels changed Arts-Loi to Hazarts-Loi, in reference to Belgium playmaker Eden Hazard. Belgium won third place at the World Cup and the team enjoyed their own heroes’ welcome in the centre of Brussels on Sunday. Also in London, the Piccadilly line station Southgate was given a temporary makeover and rebranded Gareth Southgate in honour of the England manager who took the team to its first World Cup semi-final since 1990. Congratulatory messages came from different quarters including the Louvre museum congratulating the team on its success by tweeting an image of its most famous exhibit, the Mona Lisa, resplendent in the two-starred shirt. Meanwhile, Zagreb is also preparing to welcome back the runners-up, with a parade through the centre of the Croatian capital on Monday afternoon.